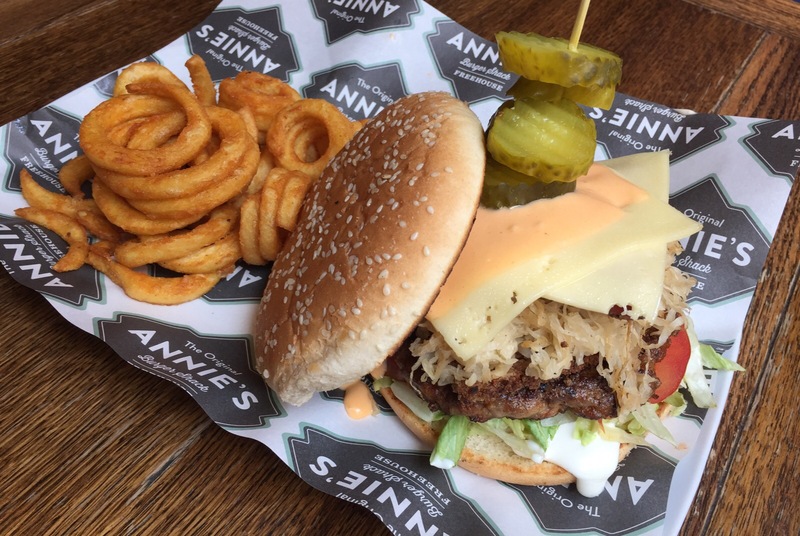 If you live in Nottingham, Annie’s Burger Shack will need no introduction. The humongous burgers are a city staple and getting a table at Annie’s often requires a small act of wizardry. I’ve been to Annie’s about half a dozen times now, and I’ve enjoyed munching my way through their huge menu. From the roast dinner burger to a burger topped with pancakes, bacon and maple syrup, these burgers are anything but boring. That said, on this visit I went for a simple option. Since it was only midday I didn’t fancy a belly-busting burger, so I opted for a hotdog instead. It wasn’t the most exciting thing I’ve eaten at Annie’s, but it was still very tasty and a bargain lunch at only £6.90. I also had a cocktail from the summer drinks menu, which was delicious. I went for the Broadway Summer Garden which was a lovely refreshing gin-based cocktail. My all-time favourite Annie’s burger is the Kogumaza, which is a combination of satay and coconut. Delicious! Annie’s also has a bar downstairs where you can play table football and drink root beer (or actual beer) to your heart’s content. I’m not a beer drinker myself but I’m reliably informed that there’s a great selection. 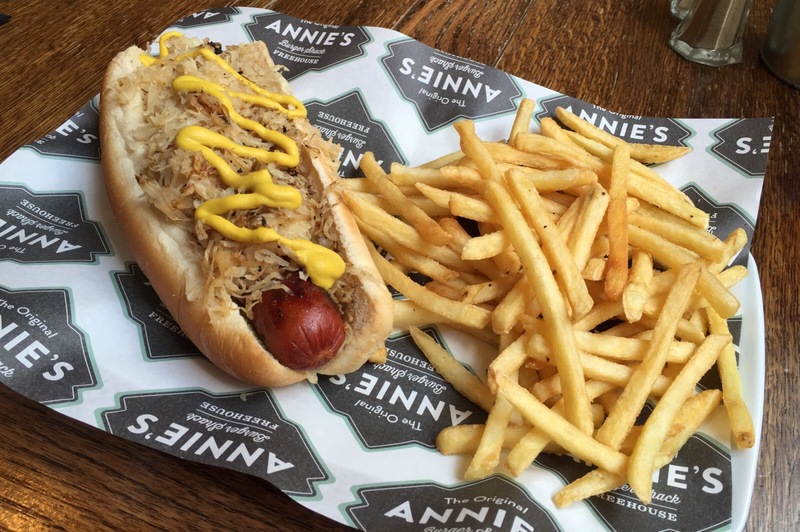 If you’re ever in Nottingham I would highly recommend a visit to Annie’s – just make sure you book a few weeks in advance! I’ve been to Nottingham a few times and I love it for shopping. However now you’ve shown me this, I think I might have to try out the food more! My mouth is positively watering, that burger looks divine! I need! Oh no! Maybe a little weekend treat is in order? Nina, 20 something, from Nottingham. Posting about the places I go, the things I enjoy (Lush, basically) and what I think about life. Thanks for stopping by! I’m sure I’m not alone in mourning the end of the four day weekend today 😭 We’ve got to drive home from the coast and I am not here for it. But I’ll have a grid full of the seaside for a week, so I guess that’s something 😉 How are you beating the Monday blues? I’m SO ready for some warmer weather and a four day weekend. Who’s with me? Today’s ~lewk~ for a spot of shopping in town (bury me in these platform Converse). As I keep banging on about, I’m trying not to buy too many clothes so I stocked up on a few budget beauty bits. Hope you’re having a great weekend! Happy Friday folks! It’s been a long week 😴 Anybody got fun plans for the weekend?